On Monday 22nd April 2019 the sun will rise at 06:00 and will set at 20:17. It will be a mild day, with temperatures reaching around 19.9°C. A few showers are expected, 3mm of rainfall is possible today. It will be quite a breezy day, with a maximum expected wind speed of 20mph. On Tuesday 23rd April 2019 the sun will rise at 05:58 and will set at 20:19. It will be a mild day, with temperatures reaching around 21.5°C. Today is expected to be a dry day, with a very low chance of rain. It will be quite a breezy day, with a maximum expected wind speed of 17mph. On Wednesday 24th April 2019 the sun will rise at 05:56 and will set at 20:21. It will be a mild day, with temperatures reaching around 11.6°C. Heavy rain which could cause some standing water is expected, 13mm of rainfall is possible today. It will be quite a breezy day, with a maximum expected wind speed of 25mph. On Thursday 25th April 2019 the sun will rise at 05:54 and will set at 20:22. It will be a mild day, with temperatures reaching around 12.2°C. A few showers are expected, 4mm of rainfall is possible today. Some quite strong winds are possible today, with a maximum expected wind speed of 37mph. On Friday 26th April 2019 the sun will rise at 05:52 and will set at 20:24. It will be a mild day, with temperatures reaching around 12.1°C. Today is expected to be a dry day, with a very low chance of rain. It could be quite a gusty day today, with a maximum expected wind speed of 41mph. On Saturday 27th April 2019 the sun will rise at 05:50 and will set at 20:26. It will be a mild day, with temperatures reaching around 11°C. A few showers are expected, 4mm of rainfall is possible today. It could be quite a gusty day today, with a maximum expected wind speed of 34mph. On Sunday 28th April 2019 the sun will rise at 05:48 and will set at 20:27. It will be a mild day, with temperatures reaching around 6.4°C. Today is expected to be a dry day, with a very low chance of rain. It will be quite a breezy day, with a maximum expected wind speed of 18mph. 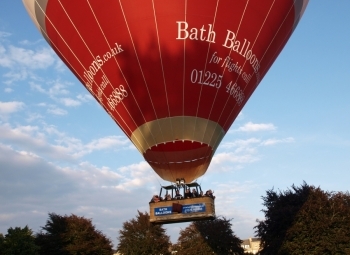 Fulfil the ambition of a lifetime, experiencing a bird's eye view while slowly drifting across the Bath landscape enjoying the magnificent experience of hot air ballooning. For a unique birthday present, anniversary gift or special treat, rise above it all! Buy one of our flexible vouchers, which are valid for 12 months and book a flight. Our aim is to give a pleasant, enjoyable and safe flight. Ballooning is an adventure, a magic carpet ride, something not to be rushed. The flight will last for about one hour, the whole outing usually takes between 3 and 4 hours. We fly in the late afternoon or evening and soon after dawn. We do not fly if it is raining or very windy. The flying season is March to October, however, "Exclusive" flights are available throughout the year. Ballooning, like serendipity, is the art of making happy and unexpected discoveries by chance. Where we go is entirely dependent upon the wind. No two flights are the same. Age is no barrier to enjoying this spectacular journey, our passengers ages range from nine to ninety. A balloon basket is a brilliant platform for photography, bring a camera and a spare battery! Chilled Champagne or orange juice is served in-flight with our compliments. Each passenger receives a commemorative flight certificate signed by the pilot. Our experienced retrieve crew meet us on landing and will return you to the launch site, usually Royal Victoria Park.